Common teeth imperfections such as chips, gaps, stains, and even misalignments can be improved with natural-looking porcelain dental veneers. These effective dental treatments are custom-made to provide a strong, beautiful fit over the affected tooth, enhancing the appearance of your teeth and improving functional issues as well. With porcelain dental veneers, the experienced cosmetic dentists at Pomerado Cosmetic Dentistry can help you restore the look of your smile with long-lasting results. If you would like more information on porcelain dental veneers, or if you would like to schedule an appointment here at our office in Poway, please contact us today. I had been considering veneers for a few years. My sister recommended Dr. Sacknoff, so I made an appt for a consultation. I liked her immediately, and I decided to go ahead and take the plunge. I get a lot of anxiety going to the dentist, so I tried to prepare myself mentally for the first appointment, which was about 4 hours to prep the teeth and get a temporary veneer for about 2 weeks, until the permanents are ready. Dr. Sacknoff and her staff were wonderful. They made sure I was comfortable and relaxed. I put on headphones and watched a few movies. Before I knew it, we were done. When I came back 2 weeks later for the permanents, I was doing fine until we were about to proceed with putting the permanents on. I was having an anxiety attack, so Dr. Sacknoff suggested we take a break so that I could relax. When I told her I was ready, I had another anxiety attack. She was so patient and understanding. She asked if I’d like laughing gas, and said it would just take the edge off, and feel like I have had a few glasses of wine, but that I’d be able to drive home. I took her up on the offer! After a few minutes of laughing gas, I was able to relax and she was able to finish cementing on the permanent veneers. I absolutely LOVE my veneers and my new smile! They are beautiful and look so natural. I’d like to thank Dr. Sacknoff and her staff, especially Tiffany, who was with me through the whole process. It’s a great office, and I highly recommend her if you are considering veneers. The first step in the porcelain dental veneers procedure begins with an evaluation of your teeth to make sure that this treatment is the best option for your goals. Once it’s determined that dental veneers can be beneficial to your needs, our dentist will take an impression of your teeth to ensure the most precise and natural-looking fit for the veneer. The impression will then be used to create a custom-designed porcelain dental veneer made by an experienced ceramist at a local dental laboratory. Composed of a durable porcelain material, the ultra-thin veneer will be affixed to your tooth with a very strong cement. Your new porcelain veneer will be custom-shaded to match the appearance of your surrounding teeth. Once a final polish is complete, your veneer should both look and feel like a natural tooth. Porcelain veneers have been one of the more popular cosmetic dentistry options for many years, and one of the reasons for that is because they are able to address so many different types of concerns. From spaces between teeth to deep stains, chips, and worn-down teeth, porcelain veneers offer a chance to eliminate the appearance of those issues with beautiful results. The goal of this treatment is to provide results that look as natural as possible. 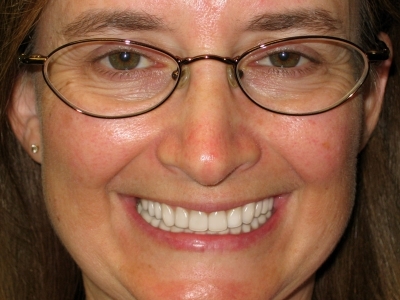 Porcelain veneers are completely custom-designed. The veneers are crafted from a dental impression of your teeth and modified to create the best possible fit and appearance. They are also color-matched to surrounding teeth for a virtually seamless blend. Once the procedure is complete, your veneer should look just like your natural teeth. A porcelain veneer is designed to cover only the visible, front part of the affected tooth. A dental crown covers the entire tooth. While veneers and crowns are both effective with addressing aesthetic dental concerns, a crown is typically a more ideal option when a tooth needs a significant amount of structural improvement after it has suffered from damage or decay. Our dentist will provide a thorough examination and will determine if a porcelain veneer or a dental crown is more appropriate for your needs. The porcelain veneer procedure should not be painful. Our dentist will apply a local anesthetic to the treatment area when the tooth is being prepared for the veneer, and we also offer advanced sedation dentistry techniques for patients who suffer from high levels of dental anxiety. Our doctors are extensively trained and experienced with these popular procedures and will work diligently to make the treatment as comfortable as possible. The overall cost of porcelain veneers varies on a case-by-case basis. A variety of factors go into the total price of the procedure, including the number of veneers that will ultimately be necessary to achieve your goals. Our practice offers convenient payment options for treatment, and we work with a reputable financing company called CareCredit® that can help qualified applicants pay for their procedure over time. Learn More About the Cost of Porcelain Veneers. Porcelain veneers are known to last very long periods of time with the proper care. In fact, longevity of results is one of the treatment’s major benefits. With good oral health habits and regular dental check-ups, many patients are able to maintain their veneers for decades. Please contact Pomerado Cosmetic Dentistry to find out more about how porcelain dental veneers can help you meet your needs. Our cosmetic dentists will be happy to meet with you and answer any questions you may have about this effective procedure.